Royal Commission on London Traffic. 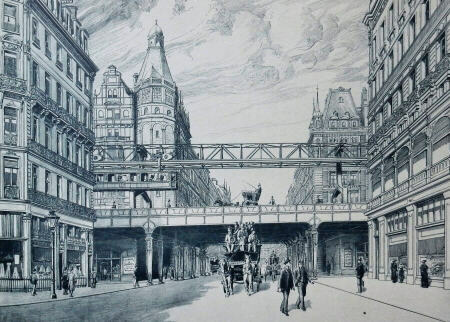 Proposed London main avenues, 1903-4. Description and drawings. At the dawn of the 20th century there took place the most comprehensive investigation ever into London's traffic problems, undertaken by the Royal Commission on London Traffic. Many visionary schemes were submitted in an attempt to reduce or control congestion, of which Meik's was perhaps the most ambitious. He and his associate, Beer, envisaged the building of two arterial "avenues" or viaducts, 160 feet wide and completely separated from existing streets, running North-South from Enfield to Croydon and East-West from Osterley Park to beyond Barking, with a junction between the two near Mount Pleasant and a river crossing and embankment between Blackfriars and Waterloo bridges. The avenues were to be double decked with the upper level taking fast through traffic and the lower, with a central dedicated section for motor cars, carrying slower, heavier traffic. The avenues were capable of expansion and at their extremities there were to be smaller branch roads. They also incorporated a comprehensive passenger transport system on the upper deck, consisting of tramlines, one in each direction, together with a monorail, modelled on Langen's recently-opened Elberfeld-Barmen line in the Wuppertal. This remarkable plan, which finds echoes in our modern motorway system, was taken sufficiently seriously by the Royal Commission to occupy two long sessions during which Meik was minutely examined on its every aspect. The present rare item was clearly prepared by Meik for his presentation to the Commission because at one point in his cross-examination (para.15622), he remarks that, "These plans have been reproduced in that small book of collotypes". The present item is a copy of "that small book", showing sections and elevations, which differ according to whether the line is in the centre of London or in the country, accompanied by two leaves of text, describing the concept behind Meik's design. Small oblong folio. (4)ff and 10 collotype plates. Orig. quarter leather.